I am so excited to share this with you. You all know what a huge believer I am in running at least an hour in each practice of transition drills. I get tons of emails, looking for ideas and drills, and new twists on drills for teams ranging from U11 to NCAA lacrosse teams to expedite the learning curve for lacrosse fundamentals. This philosophy has helped me, and helped improve practices for thousands of coaches who are members of our site. Simply put, it works. This is the biggest most comprehensive eBook project I have worked on to date. I am humbled and thankful by the hundreds and hundreds of eBooks you have purchased in the past. If you loved the Customized Practice Plans, Changing Philosophies in Coaching Lacrosse, Coaching Youth Lacrosse, or the Specialty Lacrosse Drills eBook, you are really going to love this one. 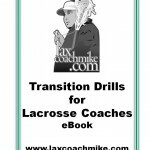 At the point of this announcement and publishing this eBook, the drills in the eBook come from our 65 hrs of interviews with top NCAA Coaches on our site, www.laxcoachmike.com, many who run the same drills in many different configurations. 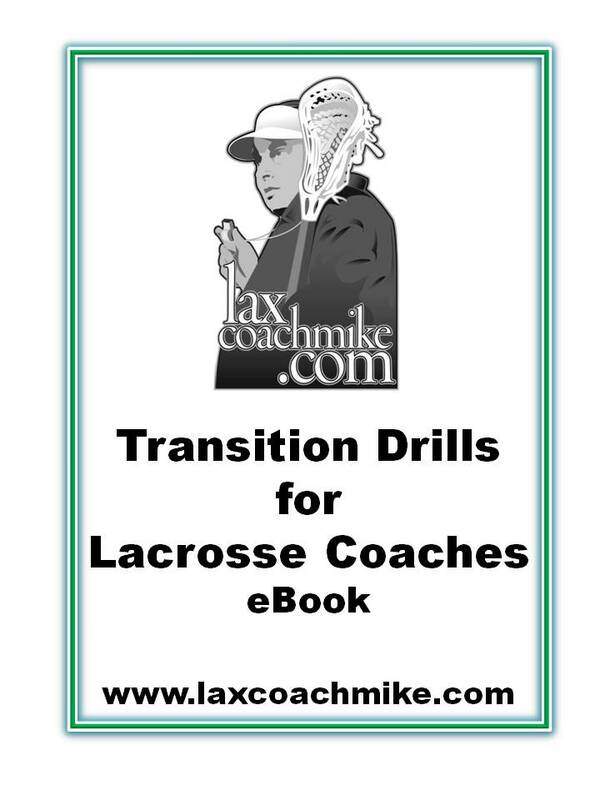 Although we promised 25 of my favorite transition drills the eBook delivers so much more… You will immediately notice we have actually included 28 transition drills/articles, (I could not force myself to pick just 25) and many offer three to four variations on each drill. So there are well over 25 drills and more than an additional 30 plus variations. Total — 70 pages of good stuff… with 29 diagrams. Disclaimer — Almost all of the drills are taken form my articles on the site, as well as other websites for which I write lacrosse coaching columns. Most are found scattered through websites and on line for free. The concept here was to compile the articles in one single heading of transition drills to help you, help your teams improve, in one single super-easy to navigate eBook. 4V3 Both Ways in the Box! We are introducing the price at $21.99 for the first month and then it will go up to the retail of $29.99 to give all these resources in one place. Again, almost all of my articles are available somewhere on the internet, for free, but here they come all in one super-easy reference eBook.